What Ingredients Are in Viagra? According to Tylenol.com, Tylenol PM is a common over-the-counter medication used to treat pain, fever, runny nose, sneezing, watery eyes and sleeplessness. In addition, Tylenol PM is available in rapid release gels that allow the medication to get into your system quickly. As with all medications, you should be aware of the ingredients in Tylenol PM and its possible side effects. Acetaminophen 500 mg is an active ingredient in Tylenol PM, according to Drugs.com. Acetaminophen acts to reduce fever and provide pain relief. This ingredient works by blocking prostaglandins, which are chemical signals that can cause fever and pain. However, Tylenol PM does not have anti-inflammatory effects like nonsteroidal anti-inflammatory drugs (aspirin, ibuprofen) do. According to Drugs.com, acetaminophen has no common side effects. 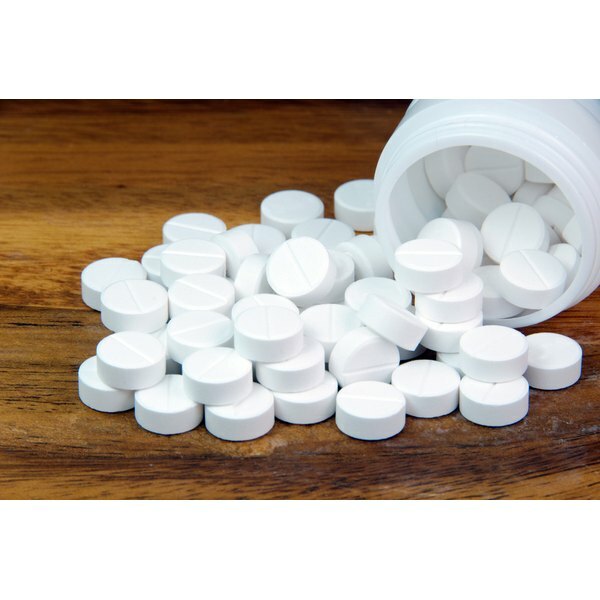 However, taking more than four grams per day, or more than one gram per dose, of acetaminophen can result in serious liver damage. Be sure that no other medications that you are taking contain acetaminophen. Tylenol.com states that diphenhydramine 25 mg is an active ingredient in Tylenol PM. This ingredient treats runny nose, sneezing, watery eyes and sleeplessness. Diphenhydramine works by preventing the release of histamine, which is a chemical signal released during infection or allergy that causes these symptoms. Histamine is also responsible for keeping you awake. Thus, by blocking histamine’s actions on the brain, you will fall asleep. The side effects of diphenhydramine include headache, dry mouth or difficulty urinating, according to Drugs.com. Be sure that you are not using any other medications that contain diphenhydramine in order to prevent overdose. Also, do not drive or operate heavy machinery when taking any medications that contains diphenhydramine. Inactive ingredients, or excipients, are substances added to a medication to help with ease of use or to support the active ingredient. The inactive ingredients in Tylenol PM rapid release gels are benzyl alcohol, black iron oxide, butylparaben, carboxymethyl cellulose sodium, crospovidone, D&C red #28, edetate calcium disodium, FD&C blue #1, FD&C red #40, gelatin, hypromellose, magnesium stearate, methylparaben, microcrystalline cellulose, polyethylene glycol, polysorbate 80, powdered cellulose, pregelatinized starch, propylene glycol, propylparaben, red iron oxide, sodium citrate, sodium lauryl sulfate, sodium propionate, sodium starch glycolate, titanium dioxide and yellow iron oxide. Consult your doctor before taking Tylenol PM if you are allergic to any of these inactive ingredients.